View from Parliament House roof, northwards. Commonwealth Avenue Avenue Bridge in centre. 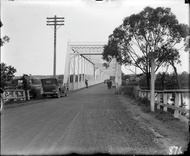 Commonwealth Avenue Bridge over the Molonglo River showing original bridge. Beginning of work on Commonwealth Avenue Bridge over the Molonglo River. 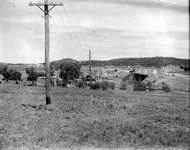 Rebuilt Commonwealth Avenue Bridge over Molonglo River, temporary bridge in background. Temporary Bridge while Commonwealth Avenue Bridge was being rebuilt. Pylon for rebuild of Commonwealth Avenue Bridge. Pile drivers for rebuild of Commonwealth Avenue Bridge. Completed Commonwealth Avenue Bridge looking south. Cotter Pump House from Murrumbidgee River Bridge. 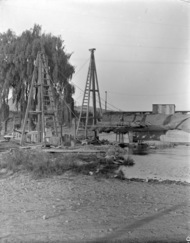 Murrumbidgee River Bridge after 1925 flood. Western approaches washed away, near the Cotter Pump House. 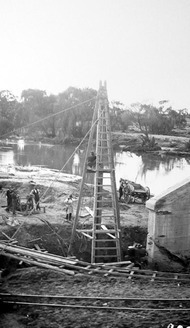 Cotter Pump House and Murrumbidgee River bridge.